…you can really stretch a load of groceries! I know I’ve said it before (and it’s also sort of the point of this blog) but I love making good, healthy and complete meals– without spending a ton of money. Oh goodness, I’ve outdone myself. I used this recipe from Giada De Laurentiis off the Food Network website as my inspiration. Of course I didn’t have all of the ingredients, so I improvised a little. Ok, a lot. Cover lentils with cold water in saucepan, bring to boil. Drain water and rinse lentils. Add broth to saucepan, bring to boil. Add lentils, reduce heat and simmer for 10 minutes. Add rice, onion, carrots and celery. Cut heat to low and stir in pesto, edamame and sun-dried tomatoes. In a loaf pan (I used one that was about 9″ x 5″ x 2 3/4″), combine lentil mixture, spinach, eggs, 1/4 cup breadcrumbs, mozzarella, 1/2 of the parmesan and season with salt and pepper. Once mixed, pat down into a loaf. 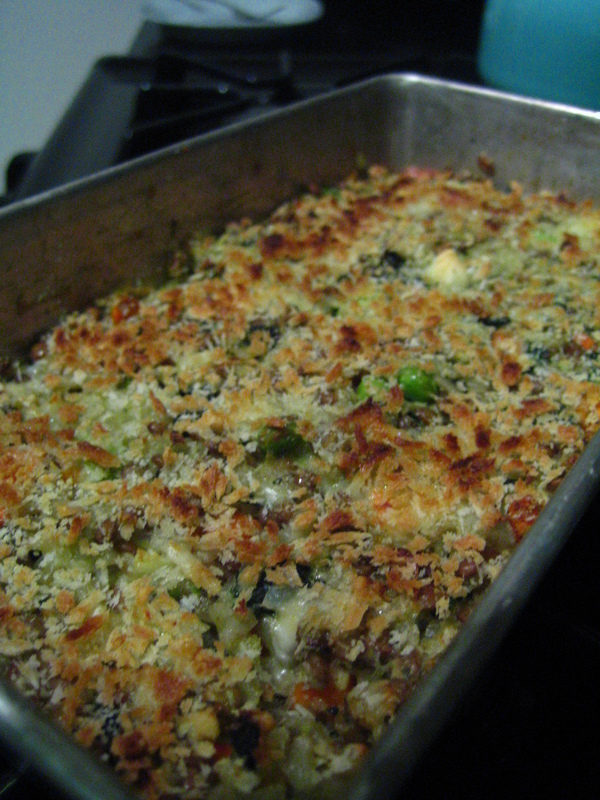 Top with remainder of breadcrumbs and parmesan and butter, cut into small pieces. Bake for about 30 minutes, then turn on broiler until golden brown. Let sit for 10-15 minutes before cutting into slices and serving. 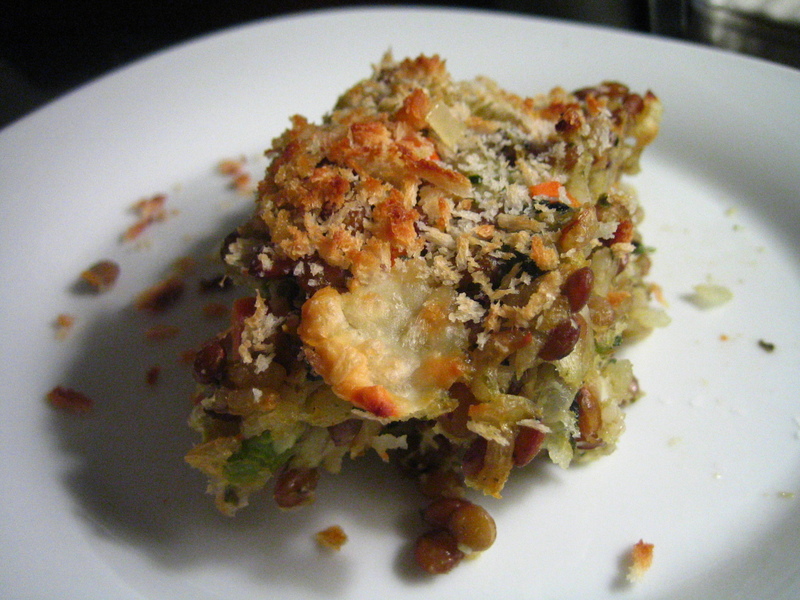 Ok, so it looks like a lot of ingredients, but you can really use any combination of veggies, grain or legume you like. I subbed edamame for the corn the recipe called for, and cooked rice for uncooked. Plus I left out the “sauce” that the recipe called for, but added the sun-dried tomato and pesto. I haven’t made this recipe before, and next time I’d add more pesto and sun-dried tomato, because they add a lot of flavor! I’d also season a bit heavier- I didn’t want to over-salt the loaf before I’d tried it but it turns out that it can stand up to a good amount of seasoning. That being said, I was pretty impressed by my effort. A thrown together meal from grocery store leftovers that’s healthy and cheap?? Now, that’s Braise The Roof worthy. When was the last time you impressed yourself with an impromptu dish? Oh Giada. She’s fantastic. Her short arms sort of freak me out… but it’s cool. I am yet to experiment with lentils… but everyone always makes such tasty-looking dishes with them! I don’t cook with lentils that often, either. I’d been sitting on this package of them for a while (well, not literally), though, so I figured it was time to do something with them! 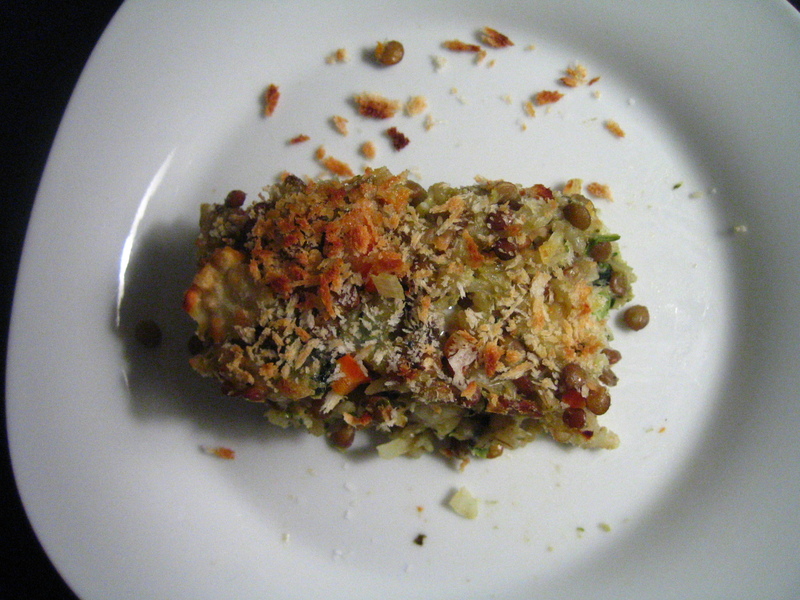 I have never seen a lentil loaf that looks good…until now. You really have outdone yourself. I don’t know anything about Giada except that everyone loves her and she’s a hot mama! Haha, crunchyyy. Eating down your pantry is sometimes the hardest thing to do! That’s why I love making things in loaf and casserole form- easier to throw whatever you have in them.